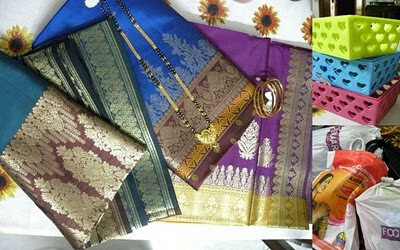 Every year, at Christmas, i give my house help a saree and some sort of a bonus. With the bandhs the whole month of december, i couldnt get this done on time. I have two ladies working for me, Renuka is the cook who makes our breakfast and lunch, she's been with me since for about 6 months, and Devi who does the other housework and has been with me for 3 years now. On christmas day, i just gave them cake and the special preparations and the bonus, and asked for time to give them the sarees. They got all giddy and giggly and said i can take my time.... i surely took them seriously!! Today after work, i set out to shop. I landed up at one of those huge malls within a store type of places.... to save me the bother of searching for something appropriate and finding many choices under the same roof. i always face this dilemma when i buy stuff for them. how does one choose for someone who does household work.... what kinds of clothes would they like to buy /wear considering most of them manage with what they get as hand me downs from their employers rather than new clothes from the store....what colours should i choose... the ones i wear are considered dull and drab by them....what material....and how much should i spend....i dont want to give them something cheap, just for the sake of giving them.... but something that they will wear and feel happy in.... is this all too much? oh and the coloured plastic baskets are for myself!! i had to pay myself a commission after all!! Also one hell of a soft blanket for K because he loves his blankets and the current razai is taking up too much space on our bed.... plus it was on discount!! @swaps: they loved them... i asked them to pick, so the blue and the dark green were picked,personally i liked the magenta one... that will go to the lady who sweeps... they were excited more with the bangles and mangalsutra!! @raaga:yeah....i know what you mean!! i m sure they must have loved them ! happy new year!